To visit his father at work in a Haifa mall, Shaul Tzimmer must first be wanded by security. It will soon be that way here too. At least it hasn’t hurt business for Shimon Tzimmer’s employers. Apparently they can still easily afford to pay him to putter about. He is delighted to see his somewhat estranged son again, but he is about the only one who voluntarily opts for the sourpuss’s company in Raphaël Nadjari’s A Strange Course of Events (trailer here), which opens this Friday in New York. Shaul Tzimmer is a divorced father who is stuck in a joyless job as a late-night hospital receptionist. The worst part about his life is his full understanding of his loserishness. For some reason, Tzimmer decides to visit the father he has not seen in years, even though he hardly shows any desire to patch things up. Regardless, he is stuck going through the motions when his father introduces him to his New Agey but age-appropriate girlfriend Bati. Shaul does not have much to say to her, but he doesn’t have much charm for anyone. Unfortunately, things will get even more awkward when a freak accident lays Tzimmer up in Haifa. It is a testament to the stringent reserve of Nadjari and his co-screenwriter Geoffroy Grison that the modest conclusion feels genuinely satisfying. I’m not saying this film is sleight of stature, but it needs a paperweight to keep it from blowing away with the wind. Arguably, Jocelyn Soubiran & Jean-Pierre Sluys’ distinctive, vaguely Middle Eastern-flavored sound track does exactly that, supplying heft and flavor to the light-weight film. In all fairness, Ori Pfeffer also deserves tremendous credit for his weirdly engaging work as Tzimmer. He is painfully standoffish, yet Pfeffer makes it clear he would like to be more sociable and approachable, but he just does not have it in him. Moni Moshonov is also rock-solid as Shimon Tzimmer, but Michela Eshet is unfortunately annoying as the batty Bati. It is rather rewarding to watch a downbeat sad sack finally try to take charge of his life, but Nadjari keeps the revelations ever so small and discreet. Frankly, the film would be more aptly titled “A Mildly Diverting Series of Loosely Connected Episodes.” Still, there is value to the work of Pfeffer and Soubiran & Sluys. 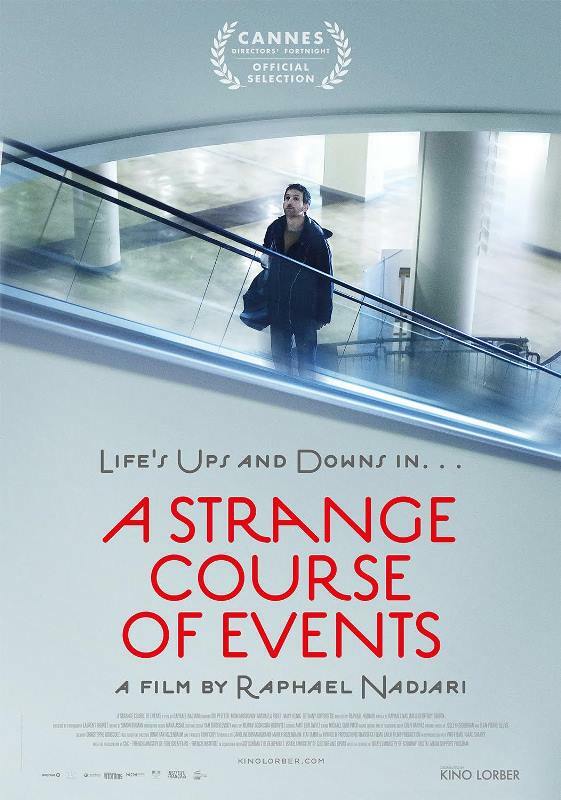 A Strange Course of Events is a nice little film, but it is as unessential as it is unassuming. Safely harmless, it opens tomorrow (2/26) in New York, at the Cinema Village.